Born on 26 June 1923 in South London, Peter Ernest Jenner was the youngest child of Ernest and Alice Jenner. He joined the Royal Navy in 1941 and sailed to the USA on board HMS Berry K312 which was involved in the Battle of the Atlantic. This conflict was the longest continuous military campaign of the Second World War, running from the start of the war in 1939 through the defeat of Nazi Germany in 1945, and was at its height from mid-1940 through to about the end of 1943. The campaign pitted the German Navy's surface raiders and U-boats against Allied convoys from North America and the South Atlantic to the United Kingdom and Russia, protected mainly by the British and Canadian navies & air forces, later aided by United States Navy ships and aircraft. The German U-boats were joined by Italian submarines after Italy entered the war in June 1940. Named after Sir Edward Berry of the Agamemnon at Trafalgar, HMS Berry was laid down at the Charlestown Navy Yard (later known as the Boston Navy Yard) on 22 September 1942, launched on 23 November 1942 and commissioned on 15 March 1943. Her commanding officer was Lieutenant Commander Pirie of the Royal Naval Volunteer Reserve (RNVR). HMS Berry returned to the US on 15 February 1946 and she was broken up for scrap. 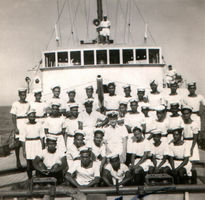 Sub Lieutenant Jenner was later deputed to the Royal Indian Navy in either 1944 or 1945 and served aboard the HMIS Madras, a minesweeper. He returned to the UK in 1946 and retired from naval service in the same year. He passed away on 03 April 1998 in Bungay, a small town in Suffolk (East Anglia, England). Amongst his possessions were several typed sheets of information given to him before he was deputed to the Royal Indian Navy (RIN) in the mid-1940s. Interestingly titled, 'Notes For The Use of Officers Who Know Very Little of India' it gives the reader an insight into the British view of India more than six decades ago and was given to all RNVR personnel that served with the Royal Indian Navy. His daughter Jane Henry was very gracious enough to scan this document, as well as the photographs below. Please click here to download this 60+ year old editorial on India which is in pdf format.